A dedicated haematology unit geared for the diagnosis and treatment of blood conditions has been opened at Netcare uMhlanga Hospital in KwaZulu-Natal. A dedicated haematology unit geared for the diagnosis and treatment of a range of blood conditions, from leukaemia to blood clotting disorders, has opened at Netcare uMhlanga Hospital in KwaZulu-Natal. 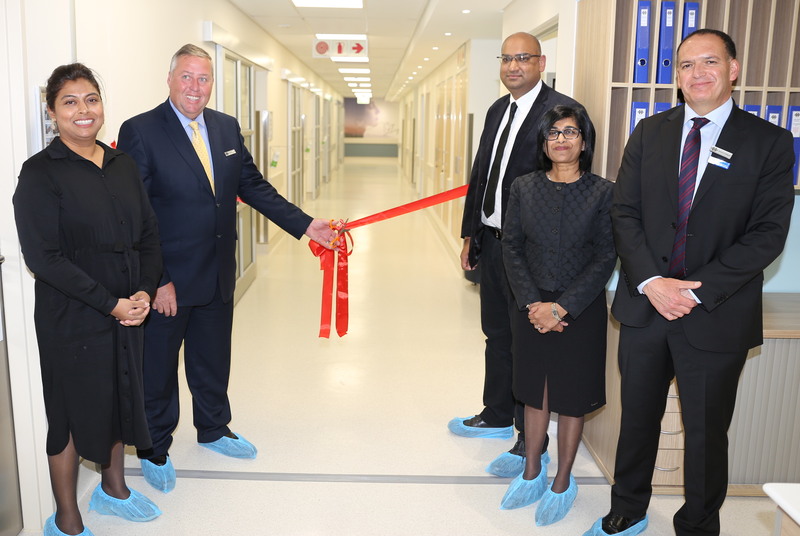 From left to right: Dr Natasha Sewpersad, clinical haematologist; Jacques du Plessis, managing director of the Netcare hospital division; Dr Rohaan Badree and Dr Dhaya Moodley, both clinical haematologists; and Dr Richard Friedland, chief executive officer of the Netcare Group. “This new custom-designed, state-of the-art facility brings hope to patients suffering from blood disorders as well as a host of other chronic and acute conditions affecting the blood,” said Dr Richard Friedland, chief executive officer of the Netcare Group, who officially opened the new unit. “The development of the unit is aligned to international trends for the establishment of dedicated facilities to treat the full range of haematology conditions. These patients require not only highly specialised care and individual management by a multidisciplinary team of experts, but a purpose-developed unit such as this to ensure the best possible treatment outcomes,” he added. Dr Dhaya Moodley, who serves on the national executive committee of the South African Clinical Haematology Society, explained that clinical haematology is a relatively young but increasingly important sub-speciality of medicine that is concerned with the study of the causes, prevention, diagnosis and treatment of blood disorders and diseases. According to Dr Moodley, who first established a clinical haematology practice at Netcare Parklands Hospital in Durban in 2004, the complete range of blood disorders including thrombotic/bleeding disorders; cytopenia, where a reduction in the number of mature blood cells occurs; as well as malignant conditions such as leukaemia, myeloma and lymphoma will be treated by the multidisciplinary team at the new unit. She says the centre also makes provision for both stem cell harvesting and haematopoietic stem cell transplantation, which are increasingly utilised in the treatment of malignant blood diseases. The harvesting service has been established in collaboration with the South African National Blood Service (SANBS). “Blood disorders are complex and require a highly specialised, multidisciplinary approach to achieve the best possible outcomes for patients. We shall utilise the outstanding facilities, skills and support services available to tailor treatment programmes to meet the specific needs of each individual patient,” she explained. According to Marc van Heerden, general manager of Netcare uMhlanga Hospital, the unit has been years in planning and development. “No stone was left unturned in ensuring that the unit met all the requirements necessary for providing a world class haematology service,” he noted. “The six isolation rooms are equipped with laminar flow with Hepa filters to prevent airborne contaminants from entering the rooms. As bone marrow transplantation patients need to be isolated within a sterile environment and from other people for a period of time, each of the isolation rooms has been equipped with an entertainment system and data connections to enable easy access to the internet and communications systems. The rooms also incorporate digital call systems for nursing staff,” he explains. Special anti-bacterial paint has been applied to the walls and ceilings of the unit and all infrastructure is linked to the main facilities management system to ensure that air flow, air-conditioning and filtration equipment is monitored closely. Renal dialysis points have been incorporated in each room so that renal dialysis can also be provided.